"Dogme" redirects here. For the language teaching method, see Dogme language teaching. Dogme 95 was an avant-garde filmmaking movement started in 1995 by the Danish directors Lars von Trier and Thomas Vinterberg, who created the "Dogme 95 Manifesto" and the "Vows of Chastity" (Danish: kyskhedsløfter). These were rules to create filmmaking based on the traditional values of story, acting, and theme, and excluding the use of elaborate special effects or technology. It was an attempt to take back power for the director as artist, as opposed to the studio. They were later joined by fellow Danish directors Kristian Levring and Søren Kragh-Jacobsen, forming the Dogme 95 Collective or the Dogme Brethren. Dogme (pronounced [ˈd̥ɒwmə]) is the Danish word for dogma. Lars von Trier and Thomas Vinterberg wrote and co-signed the manifesto and its companion "vows". Vinterberg said that they wrote the pieces in 45 minutes. The manifesto initially mimics the wording of François Truffaut's 1954 essay "Une certaine tendance du cinéma français" in Cahiers du cinéma. They announced the Dogme movement on March 13, 1995 in Paris, at Le cinéma vers son deuxième siècle conference. The cinema world had gathered to celebrate the first century of motion pictures and contemplate the uncertain future of commercial cinema. Called upon to speak about the future of film, Lars von Trier showered a bemused audience with red pamphlets announcing "Dogme 95". In response to criticism, Trier and Vinterberg have both stated that they just wanted to establish a new extreme: "In a business of extremely high budgets, we figured we should balance the dynamic as much as possible." The first of the Dogme films (Dogme #1) was Vinterberg's 1998 film Festen (The Celebration). It was critically acclaimed and won the Jury Prize at the Cannes Film Festival that year. Lars von Trier's Dogme film, Idioterne (The Idiots), also premiered at Cannes that year but was less successful. Since the two films were released, other directors have made films based on Dogme principles. French-American actor and director Jean-Marc Barr was the first non-Dane to direct a Dogme film: Lovers (1999) (Dogme #5). The American Harmony Korine's film Julien Donkey-Boy (Dogme #6) also was considered a Dogme film. The end credits of Het Zuiden (South) (2004), directed by Martin Koolhoven, included thanks to "Dogme 95". Koolhoven originally planned to shoot it as a Dogme film, and it was co-produced by Trier's Zentropa. Finally, the director decided he did not want to be so severely constrained as by Dogme principles. Since the late 2000s, the emergence of video technology in DSLR photography cameras, such as the Canon EOS 550D, has resulted in a tremendous surge of both feature and short films shot with most, if not all, of the rules pertaining to the Dogme 95 manifesto. However, because of advancements in technology and quality, the aesthetic of these productions typically appears drastically different from that of the Dogme films shot on Tape or DVD-R Camcorders. Largely erasing the primitive and problematic features of past technologies, newer technologies have helped Dogme 95 filmmakers achieve an aesthetic of higher resolution, as well as of lower contrast, film grain, and saturation. Shooting must be done on location. Props and sets must not be brought in (if a particular prop is necessary for the story, a location must be chosen where this prop is to be found). The camera must be hand-held. Any movement or immobility attainable in the hand is permitted. The film must be in colour. Special lighting is not acceptable. (If there is too little light for exposure the scene must be cut or a single lamp be attached to the camera). Optical work and filters are forbidden. Temporal and geographical alienation are forbidden. (That is to say that the film takes place here and now). Genre movies are not acceptable. The film format must be Academy 35 mm. The director must not be credited. The above rules have been both circumvented and broken from the first Dogme film to be produced. For instance, Vinterberg "confessed" to having covered a window during the shooting of one scene in The Celebration (Festen). With this, he both brought a prop onto the set and used "special lighting." Trier used background music (Le Cygne by Camille Saint-Saëns) in the film The Idiots (Idioterne). Korine's Julien Donkey-Boy features two scenes with non-diegetic music, several shot with non-handheld, hidden cameras and a non-diegetic prop. Trier, however, praised the film's transgressions on an interview released on the Epidemic DVD. Since 2002 and the 31st film, a filmmaker no longer needs to have his work verified by the original board to identify it as a Dogme 95 work. The founding "brothers" have begun working on new experimental projects and have been skeptical about the later common interpretation of the Manifesto as a brand or a genre. The movement broke up in 2005. Complete list is available from the Dogme95 web site. 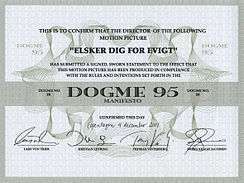 The 2001 experimental film Hotel, directed by Mike Figgis, makes several mentions of the Dogme 95 style of filmmaking, and has been described as a "Dogme film-within-a-film". The use of 'Dogme 95' style filming is in a list of a hostage taker's demands in the Black Mirror episode, "The National Anthem". Keyboard player and music producer Money Mark used principles inspired by Dogme 95 to record his Mark's Keyboard Repair album. In 2015, the Museum of Arts and Design celebrated the movement with the retrospective The Director Must Not Be Credited: 20 Years of Dogme 95. The retrospective include work by Lars von Trier, Thomas Vinterberg, Jean-Marc Barr, Daniel H. Byun, Harmony Korine, Kristian Levring, Annette K. Olesen, and Lone Scherfig. 1 2 Utterson, Andrew (2005). Technology and Culture, the Film Reader. Routledge. ISBN 978-0-415-31985-0. ↑ Krause, Stefanie (2007). The Implementing of the 'Vow of Chastity' in Jan Dunn's "Gypo". Verlag. ISBN 978-3-638-76811-5. ↑ "The Director Must Not Be Credited: 20 Years of Dogme 95". Museum of Arts and Design. Museum of Arts and Design. Retrieved 5 August 2015. ↑ Berman, Judy. "What Dogme 95 did for women directors". The Dissolve. Pitchfork Media, Inc. Retrieved 5 August 2015. Roberts, John (November–December 1999). "Dogme 95". New Left Review. New Left Review. I (238).